The music on this extraordinary compilation of late baroque recorder pieces come from a collection of the then Viceroy of Naples, Aloys Thomas Raimund von Harrach, an Austrian diplomat who collected these manuscripts from 1707 to 1733. A part of this collection is now located in New York, and it contains the largest collection of solo flute literature from Naples. Many of these important works on this CD are receiving their first recordings. 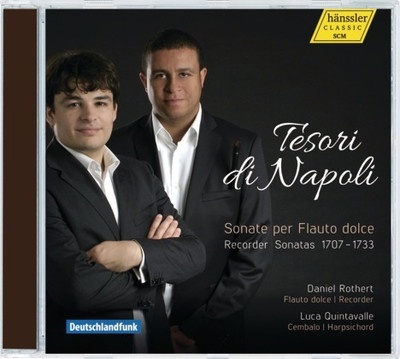 The two young performers Daniel Rothert and Luca Quintavalle are excellent musicians with a precise knowledge of these unique works and display a sense of joy in presenting this virtuoso repertoire. Telemann: Sonata in A minor TWV 42:a5, Sonata TWV 41:c3 in C minor for flute or violin & b.c.